Baby in a Wedding Train – Dwonna Know What I Think? What do you think about the bride in Jackson, Tennessee, who strapped her one-month old baby to the train on her wedding gown and dragged her down the isle? Here’s my short answer—it was both dumb and tacky and ridiculous. The mother, Shona Carter-Brooks, told naysayers on her Facebook page that she and her husband Jonathan “do what we want, when we want, as long as Jesus on our side everything worked out fine and gona [sic] continue to be fine.” She added that the “infant was awake and well secured on my train.” To bring Jesus into a conversation when she already has at least one child out of wedlock (she also has another daughter) is kind of silly, and to suggest that she can do whatever she wants with her baby is even sillier. Is Carter-Brooks suggesting that she can beat and starve and sexually abuse said child because she has “Jesus on her side”? Her wedding coordinator even went so far as to suggest that Carter-Brooks’ decision to drag her daughter in her train has “significant” historical value. “It indicates the dedication of her mother (and father) toward caring for her child and family…. A GOOD mother takes her child wherever she goes, even down the aisle,” wrote Kaye Jordan. Listen, a GOOD mother does not strap her daughter in her wedding gown’s train and then drag her down the aisle, and I agree with other commentators who have suggested that someone should call Child Protective Services. Many conservative pundits have pointed out that we have gone from a society that used to shame women who had children out of wedlock to one that celebrates pregnant women in white wedding dresses and embraces including these children in weddings. I’m glad that we no longer shame women who have children outside of marriage, but more women need to take greater care in protecting their children from harm, and this includes not dragging them down the aisle in their wedding gown. A GOOD mother should protect her children from harm, and when she does something stupid like Cater-Brooks did, she should spend less time defending her dumb stunt and more time figuring out how to not do dumb things again. I get so annoyed with people who use God as a reason for unnecessary BS. 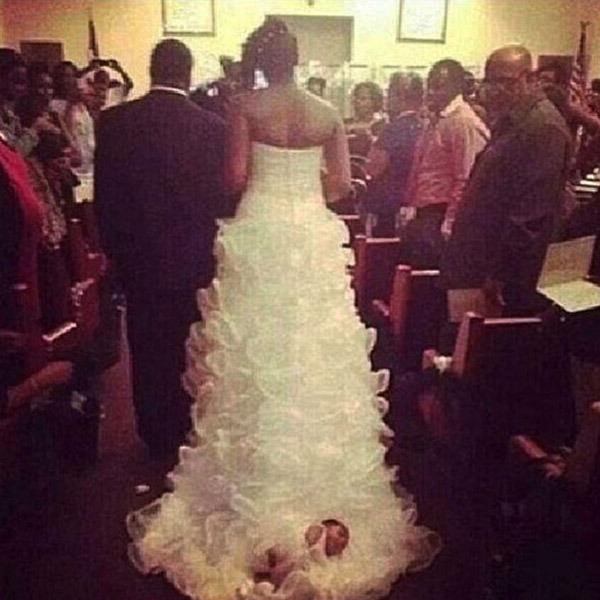 God is not a reason to drag a newborn down the aisle on the train of a wedding gown. She did something that most states would label as abuse, but I guess it’s okay because she has God on her side. What’s even funnier is there are people condoning the mess. The wedding consultant should have declined the job once the bride’s intentions were revealed. In no way would I be involved in something like that. Did you see the picture? The guests weren’t looking at her with admiration. One man was looking at her train with disgust on his face. She then apparently brags about wearing a Vera Wang wedding dress…I’m sure the State of Tennessee’s Department of Children’s Services will have something to say.